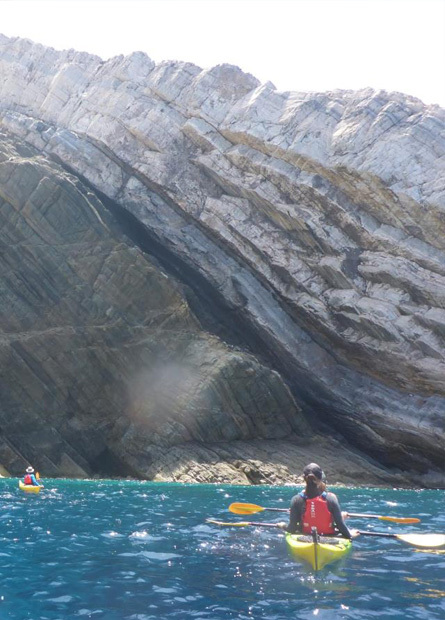 The North East part of the island is interesting for sea kayaking because it forms a peninsula that widens at the tip and is suitable for a circumnavigation in a day trips time providing suitable wind conditions. 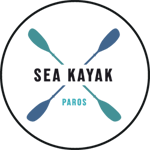 In less then ideal wind conditions different route variations are available. On the eastern part we start on the turquoise waters of Filizi, pass by the very popular beach of Santa Maria and its smaller sibling Mikri Santa Maria. We leave the crowded waters of the bay and paddle across the rocky coastline where if we're lucky we might spot the pair of Peregrine Falcons that is found there. We arrive at the bay of Zevlogiani where remnants of an old shipyard give us clues of the islands long maritime tradition. Off the coast there is a number of isles that we can easily explore if we feel strong. These islets host significant numbers of Sea gulls, Cormorants and depending on the time of year Little Egrets. We continue to the beach of Platia ammos, a wide sandy beach that is looking to the North and thus gets affected by the prevailing summer Northern winds, the 'Meltemia'. Leaving the small island Ghaidouronisi behind we move along the impressive cliffs that guard the entrance to the big bay of Naousa. On our final paddling parts we experience the beauty of Lageri, a small bay with crystal clear turquoise waters and a fine sanded beach surrounded by sand dunes and salt tolerant vegetation. Our break spots may vary depending on our chosen route. Starting at the edge of Tsoukalia beach we paddle South through an interesting rocky coastline, with scattered rocks, impressive cliffs and long slopes with mixed vegetation and the occasional grazing wild goat. After a shallow cave we arrive at the mouth of Molos bay, a big sheltered bay with a long beach engulfed in it. We usually opt to have our snack on an adjacent beach that its surrounding walls are made of silt and traditionally people cover themselves with it since it benefits the skin, a true nature's spa. After treating ourselves with this body delicacy we continue South through some very interesting rock gardens that offer an occasional little isolated beach within them. We choose the best of them to relax, swim and have lunch. If we feel strong we can extend the trip and visit the picturesque village of Piso Livadi. 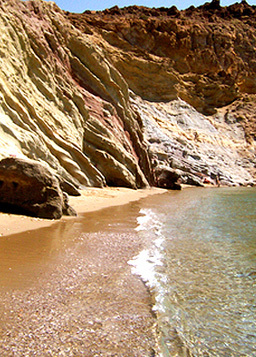 On this day trip we start from the quiet beach of Tripiti. Moving west we explore the rocky coast and play into rock gardens that we meet along the way. We come across big limestone cliffs that are surrounded by crystal clear blue waters and stop for a snack and swim in a natural 'pool', a tightly enclosed rocky cove that has served as a hideout for a famous war-lord during the Greek revolution of the year 1821. 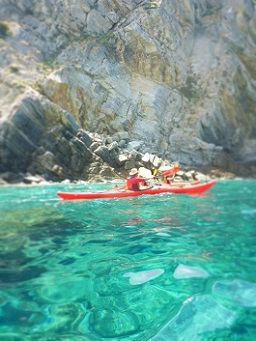 We resume paddling and head into the big roofless blue cave, an amazing place that is best visited with a sea kayak. Along some high rock cliffs, ideal for Deep Water Solo climbing we reach a couple of tranquil sandy beaches that will offer us our lunch spot. 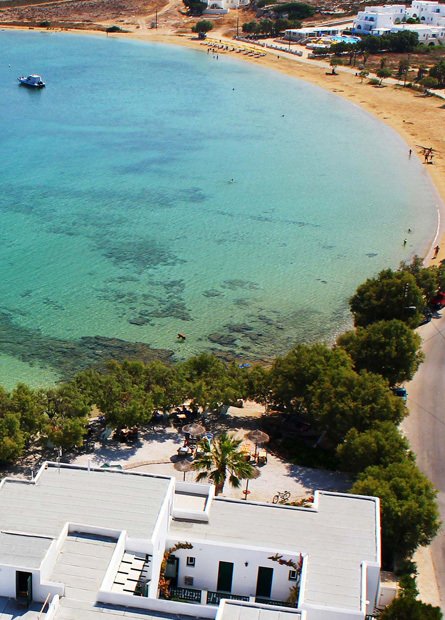 Faraggas, a famous beach on the island is just around the corner and a short visit to it completes our route. This day-trip explores the group of 6 isles situated between Paros and Antiparos. 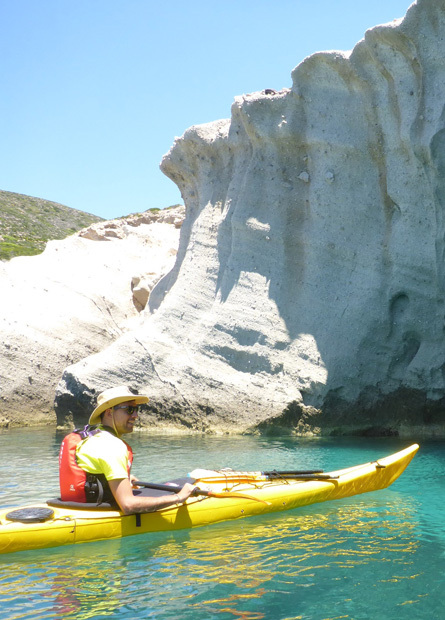 Our trip starts at the Southern part of Paros and we quickly paddle the small distance to the first isles. We arrive at a small and sheltered lagoon-like bay that has turquoise waters and surely invites for a swim. After a snack we have the option to circumnavigate the isle, pass in front of the sea cave that has an underwater entrance and start the crossing to the second group of isles. There we stop for our lunch and visit the small chapel built to protect the sailors. We resume paddling and some play amongst rock gardens and finish with the last crossing back to Paros. 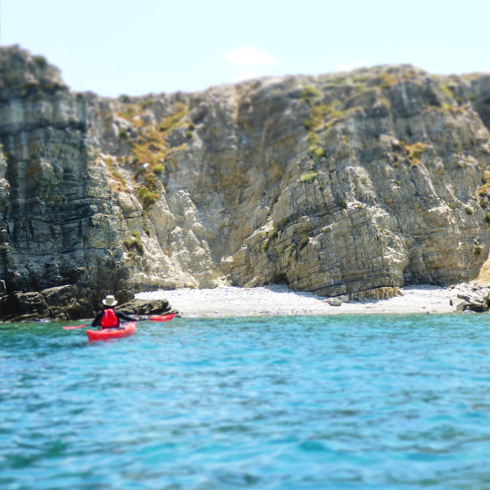 On this day-trip we paddle along the East coast of the Southern peninsula of Antiparos. Moving close to the coast we observe nice rock formations of volcanic origin. We come across many beaches and we chose one for a snack and swim break. As we resume paddling we progress towards the Southern cape 'Skilos' and enjoy the view and energy of the open sea that lays ahead of us. Our lunch break is taken in the bay of Faneromeni, a small very pretty cove with a sandy beach and light blue waters. If we feel like it we can walk and visit the little chapel that has given the name to the bay. This area is magnificent to paddle and more than one day-trip variations exist here. The Southern part of Antiparos is geologically very interesting with a volcanic origin. The coastline is composed of high cliffs, double entrance caves, arches and fjord like inlets. Rock types vary, offering lots of colors and forms to see. Beaches are few and consist mostly of pebbles. In the sea kayaks we are in the best 'transportation' means to witness all that spectacular scenery from the closest possible distance. In some day-trip variations we cross to Despotiko, a small island that had a very important place in the commerce of the ancient times (500 BC). Here archaeologists have found impressive ruins of temples and the excavation is still ongoing. 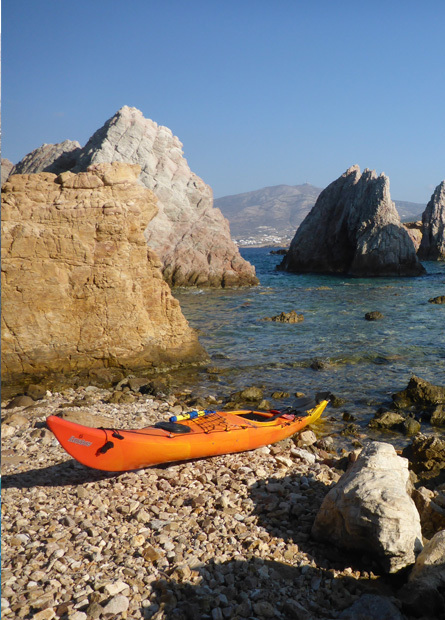 Despotiko is also beautiful to kayak, with nicely sheltered rocky coves and sandy and pebbled beaches. On this day-trip we move North along the West coast of Antiparos. 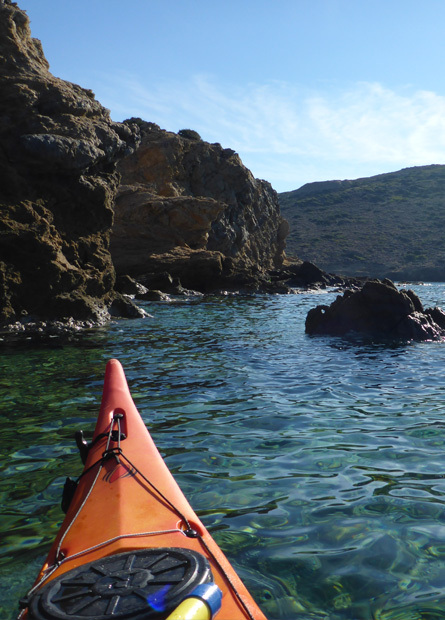 After passing in front of the picturesque little church of St George that has given the name to the whole area, we paddle along a rocky coast that has hidden within it small sandy beaches. We take a break for a snack and swim and resume paddling to our final destination, Monastiria beaches which are very sheltered fjord like bays. Along the way we play in rock gardens and narrow passages. We surely take time to paddle a little further and check the big geometric rockface that has perfectly shaped corners on it. This day-trip moves along the rocky coastline of West Antiparos. High cliffs and slabs diving in the sea, geometric features, big overhanging rocks and a variety of different colors compose the scenery we paddle through. We witness the results of recent geological processes of volcanic origin. Beaches are not common in this area so we choose the ones available for our first break. Our main lunch break is taken at the sheltered fjord like bay of Monastiria just after the impressive high 'cornered' rockface. We start our paddle with the short crossing of the Paros-Antiparos strait and head to the Northern part of Antiparos. Here, the sea bottom is sandy and shallow (2m), the water is crystal clear and turquoise and with the sea kayaks we experience that in its maximum effect. We opt to take our first stop in one of the available sandy beaches. After a swim and a snack we continue North and pass through a narrow passage that forms between the two isles. 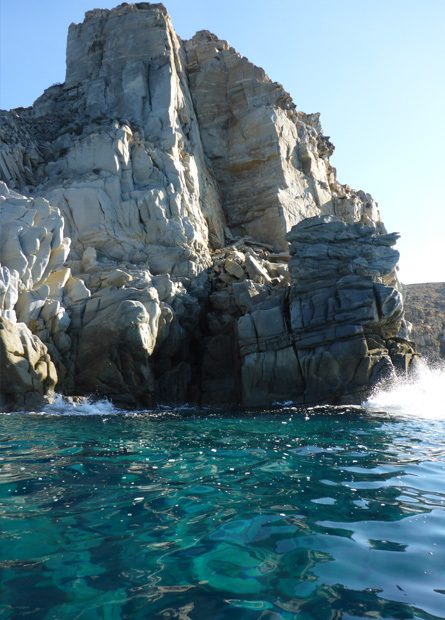 Leaving an impressive coastline with three - colored rocks on our right hand we cross to the St Spiridon isles complex. 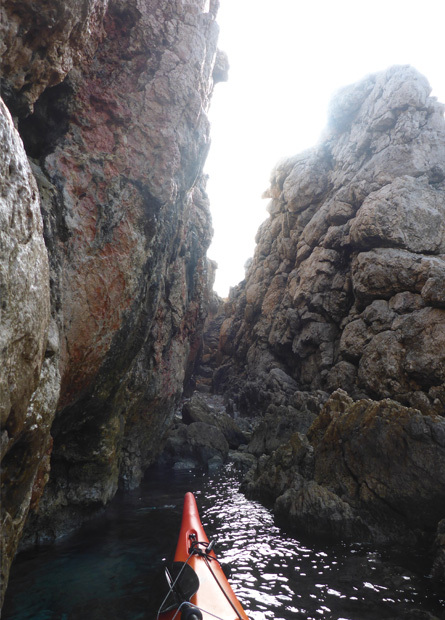 These isles form an ideal rocky playground for sea kayaking, with arches and narrow passages waiting to be explored. For our lunch break we walk up to the chapel and enjoy it with a panoramic view. 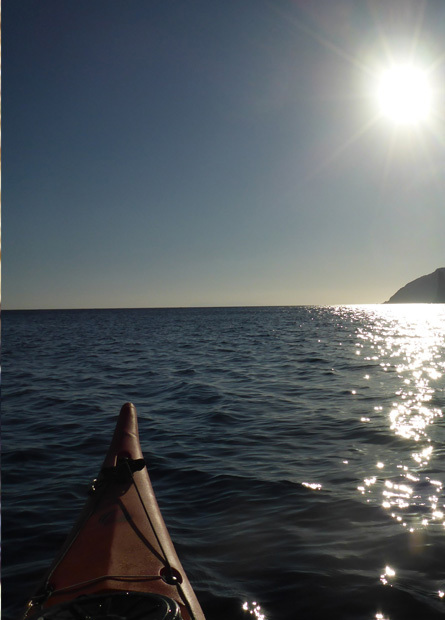 On our paddle back we take a shorter and different way, one that goes through the other side of the isles. Starting at the edge of the bay of Paroikia we move Southwest following the coastline. On our way we meet rock gardens and if we want we use them to play and practice kayak maneuvering skills. We reach a sandy beach and have our first break. 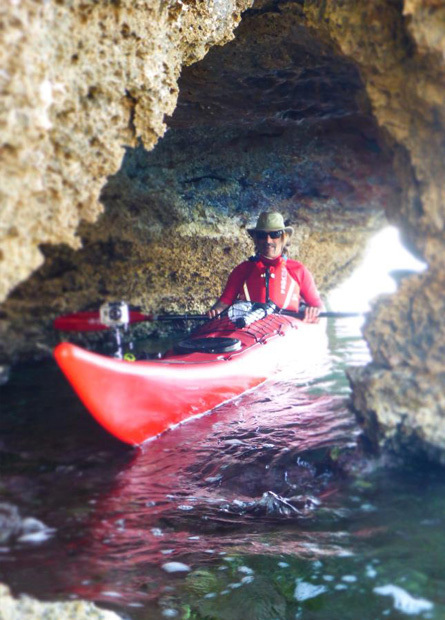 When we resume paddling we head to the 'hollow' cave, a double entrance sea cave in which we enter with our kayaks. Our day-trip either finishes on the sheltered beaches opposite Antiparos, or with a crossing to St Spiridon isles. This trip circumnavigates St Ioannis peninsula. We start from the narrow neck of the peninsula at the East coastline, paddle by the sheltered bay of St Ioannis and head to the mouth of Naousa bay. Along the rocky coast we choose to stop at the impressive tunnel - arch with the flat rocks. Paddling on towards the foot of the big lighthouse situated at the Northern cape we observe the high rocky faces that surround and guard the lighthouse. We paddle on through rock gardens and impressive rock formations till our final destination and lunch, the standalone arch shaped like the Greek letter Π. We return and finish to were we started, on the other side of the peninsula's narrow neck. On the Northern part of the island lies a big bay that hosts Naousa village. 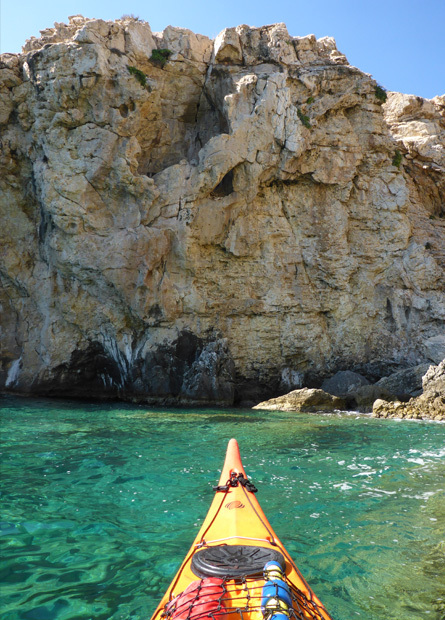 We start North of Naousa village and paddle through the whole coastal part of the it. We literally move few meters next to old, white traditional village houses that are built right were the waves break. We next visit the small island of Analipsi, have a snack and swim and if we want walk up to the little chapel. Paddling South we reach Kolimpithres beach, a unique area scattered with granite like boulders of various curved forms. Just above, looking high on the top of a hill we see the area where archaeologists have found ruins of an ancient acropolis (citadel of fortified town). Our trip continues to the North part of the bay and the turquoise shallow waters of the sheltered cove of St Ioannis. After our lunch break we resume paddling by realizing one of the longest crossings of Sea Kayak Paros day-trips, going back to the other side of the bay and our starting point. What did they say about us !